Interview with Mark Means, John Merriam and Jeff Saviano conducted January-February 2010. Hail the mighty black and gold, hail the Tigers brave and bold. 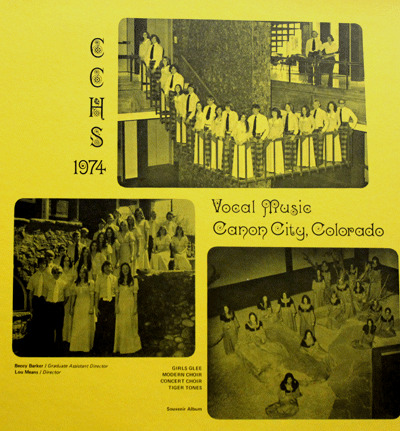 Hail to Cañon City High, sing her praise to the sky. To her we will ever sing, to her highest honor bring. In the future as of old, hail the mighty black and gold. Long before FOX had a hit TV show about a glee club, Lou Means lived the real thing. The Cañon City High School Music Director orchestrated four different singing groups on campus - Modern Choir, Concert Choir, Girls Glee and the Tiger Tones. In 1974, Means was known as the "King of Pop" around CCHS - teaching his students not only the archaic melodies of "Greensleeves," but also Beatles and Rolling Stones songs. 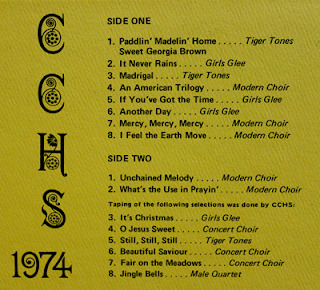 "Oh yeah, dad made choir fun," said Mark Means, who graduated from CCHS in 1976, and was a member of the school's Tiger Tones singing group. "We didn't sing the old standards, we sang what we heard on the radio." Lou Means grew up in Nebraska, where he too was a singer and songwriter. He moved to Colorado with a master's degree in music, and made his home in Cañon City. It was Means' idea to record an album of songs performed by the four groups. He set up a mock recording studio in the high school choir room, and convinced the school to pick up the tab for the recording equipment. The groups recorded Christmas standards, along with a mix of modern pop songs, including Righteous Brothers, Carole King, and Paul McCartney hits. 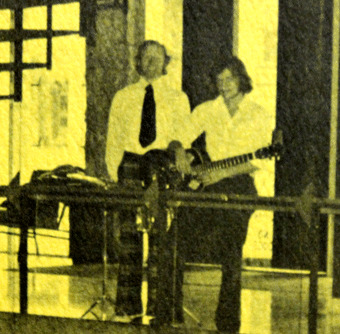 "He was a pretty cool teacher, and everybody liked him," said John Merriam, who sang in the modern choir, and was one of the guitar players on the album (and who is incorrectly listed as Fred Merriam on the LP - Fred is his older brother). The LP was given to choir members and sold around town. The success of the record prompted Lou Means to record similar releases in 1975 and 1977. Means retired from CCHS in 1990. He passed away in 2008. Choir alumnus include Jeff Saviano, who went on to become a disc jockey at KRLN in Cañon City, and later in Colorado Springs. He is now a criminalist. "Lou was great," said Saviano. "He was also instrumental in getting a grant for me to attend the University of Southern Colorado (now CSU-Pueblo) when I went off to study psychology. After I went to college, Lou allowed me to arrange some pop music for the CCHS choirs." 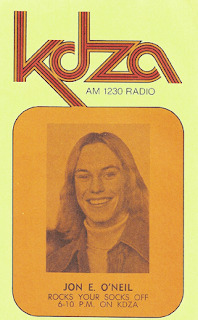 John Merriam started a long, successful career in radio, also getting his start at KRLN in Cañon City, then moving on to KDZA in Pueblo, right after graduating from CCHS, in 1975. He would go on work at Los Angeles powerhouse KHJ. He came back to Colorado to forecast weather at KOAA-TV, from 1979-1981. He then moved on to radio stations in New Mexico and Texas, before settling in Michigan, where he has a voice-over business. Greg Eden went on to front his own successful Colorado band, Big Al and the Hi-Fis, and JoAnn Ewing, is a member of the group Sierra Gold, which includes Richard Baca profiled here. Mark Means moved to Albuquerque and runs his own film and video production company Fire Creek.